Concrete samples are generally tested in laboratory under controlled temperature and normally kept constant. Numerous tests were performed to set different standard and were conducted in temperate climates; so the temperature range of (18~21)0C were taken standard temperature. Therefore information found about properties of concrete in both fresh & hardened state was based on this range of temperature. But practically concrete production and placing is done under wide range of temperature. The production and placing may be done, if required, in controlled temperature; at least up to certain period but it serves us at many extreme temperature, say under fire, explosion and under cryogenic temperature. Here we will discuss about change of workability with temperature. Ambient temperature obviously affects workability of concrete; we will consider temperature of concrete itself. We will express workability, as usual, by slump, slump loss and change in water requirement; slump loss means loss of workability. 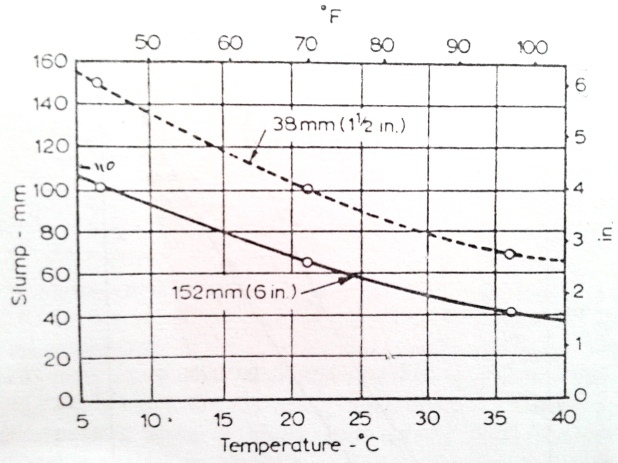 Following figure shows temperature effect on slump of concrete. A concrete mix having same proportioning shows slump change form 105 mm to 38 mm for a temperature increase from 50C to 400C(maximum aggregate size=152 mm). We know there have relation between time and change in workability. 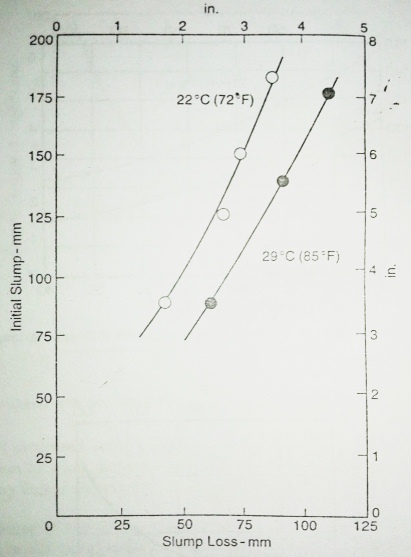 Temperature increase also affects change in slump with time. This influence of temperature is less pronounced in stiff concrete mix as this mix is less sensitive to change in water content. To maintain stable early workability, in hot day, water content of the mix has to be increased. 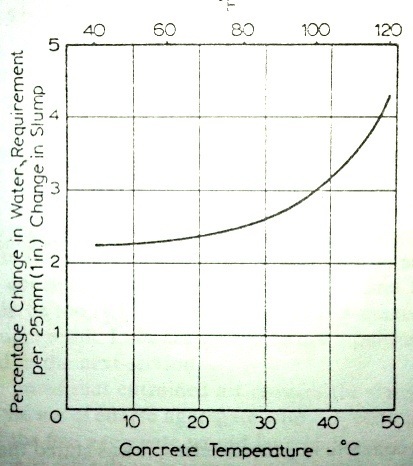 Above figure describes us increase in water requirement as percentage to change in slump of fresh concrete by 25 mm with change (increase) in concrete temperature. The slump loss with time is shown in following figure by plot of initial slump vs. slump loss after 90 minutes from water added to mix; cement content of this mix was 306 kg/m3.